Here we go! My last draft was from July and I’ve asked for all of you to let me know your status, and most of you did!! Thank you! The list is still pretty deep, but you never know the circumstances in people’s lives and how the selection process will pan out until it actually happens. 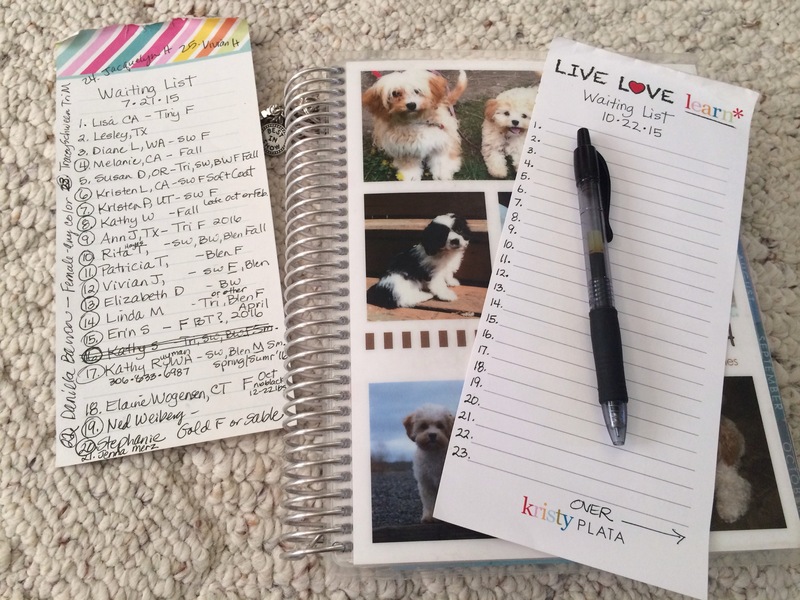 It is not uncommon for someone brand new to slide in and snag a pup, ahead of everyone on the list simply because a particular pup was not the right color or gender or the timeline wasn’t quite right for those waiting. And this brings me to a special request regarding Christmas being around the corner. I will be asking that you choose your puppies a little sooner than normal because I have people asking me if they can get a Christmas puppy. I will need to know ASAP if you are going to pass on the current litters, so I can tell new people if we have Christmas puppies or not. 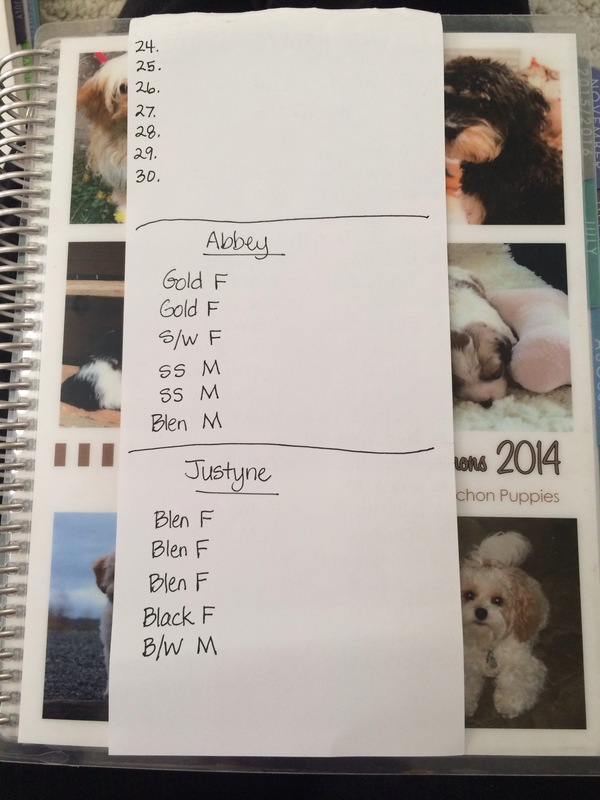 Below is the old list, the new list, and the genders and colors of puppies that were just born. We also definitely have 2 more pregnant females, due the 25th and 29th of this month. After that, we are looking at early spring before we will have more puppies ready to go home. If you are on the waiting list, please email me and let me know if you have any interest in the current litters based simply on the color and gender combinations. This is not a final decision, just a rough draft of what you’re interested in. I’d like to hear from all of you, even if you are passing on these litters. Puppies will be ready to go home starting December 15. Also, if I don’t have any details near your name, please email me with color/gender preferences as well as any timeline needs you may have (for example, you have a family vacation planned and you can’t get a puppy till after a certain date). Thanks and I’ll post pictures soon! Hi. 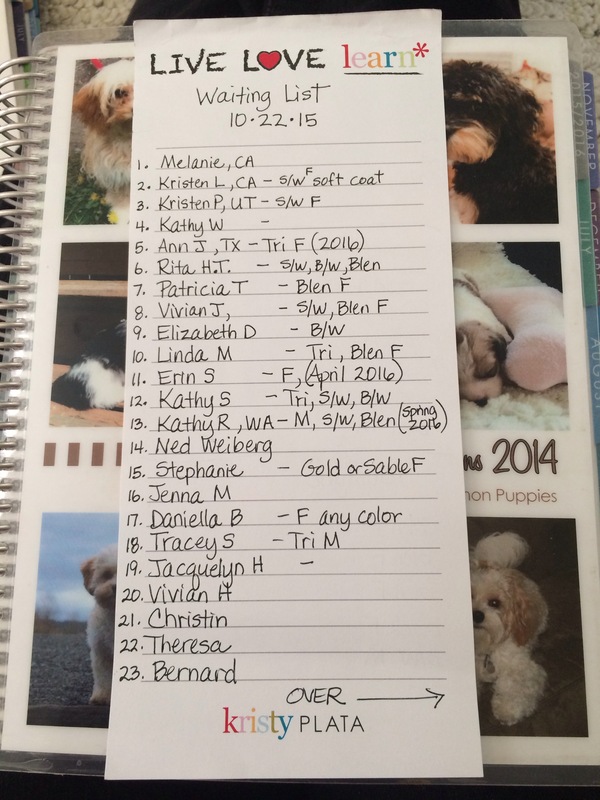 I will pass on these current and upcoming litters. Good luck with this new crop of puppies! Thanks for taking me off the list. I am just not ready. Work too demanding right now.